Mrs. Wiecek: You help me? P.J. McNeal: No, I'm afraid I couldn't do that. I'm only a reporter. I just write the story. In the turmoil of prohibition Chicago, a policeman is shot dead in a speakeasy. The investigation takes the police to Frank Wiecek (Richard Conte) and his wife, Helen (Joanne De Bergh), who maintain that they were at home that night with Frank's friend, Tomek Zaleska (George Tyne). Despite their pleas of innocence, Tomek and Frank are identified by the speakeasy owner, Wanda Skutnik (Betty Garde), and sentenced to 99 years imprisonment. Like the great 1946 film noir The Killers, Call Northside 777 is an after-the-fact thriller. Eleven years pass after the conviction of the two men until a Chicago newspaper's editor, Brian Kelly (Lee J. Cobb), notices an ad in his paper offering $5,000 to whoever gets Frank Wiecek out of prison. Kelly sends his best journalist, P.J. McNeal (James Stewart), to investigate the story. The cynical McNeal discovers that Frank's mom, Tillie (Kasia Orzazewski), saved the money scrubbing floors to help her son. Such devotion has little effect on McNeal, however, who maintains that Frank is just another cop-killer that got what he had coming. Yet, as the story continues to snowball in its popularity, McNeal finds himself coming to believe in Frank's incredible story. Will his role as a journalist become compromised by his attachment to the drama of Frank's life? Does he have the ability to draw out the hibernating Wanda Skutnik in order to arrange for Frank's release? Henry Hathaway's adaptation of a true story works amazingly well, mostly because the actors pull of their performances with professional grace. Sure, there are the obligatory scenes that fulfill the noir quota of suspense and danger, but the most interesting scenes are the character moments between McNeal and his wife, Laura (Helen Walker—who takes a break from her usual femme fatale role here). Stewart, usually associated with the naïve sentiment of Jefferson Smith, makes for a perfect no-nonsense investigative reporter. As the story progresses, McNeal's transformation from skeptic to impassioned believer is credible due to the nuances of Stewart's portrayal. When the film moves into its final third, it is the sincerity of the character's pursuit for truth that makes the story compelling. Cobb and Conte supply excellent support as well, giving sober performances that aide the story in its pursuit of realism. Additionally, the scene where McNeal visits Wiecek's wife turns in a show-stopping performance from Joanne De Bergh. The love and sorrow in her face and her voice speak volumes about what it must be like to love someone behind bars. Along with the acting, the filmmaking furthers the drama through its rich black-and-white cinematography by Joe MacDonald, who creates rich layers of darkness and depth with his lighting schemes. Invaluable in bringing the urgency of the story to bear are the authentic locations used. Both the production design and cinematography work to create a documentary style film noir, being realistic and stylized simultaneously. Adding to the documentary feel is the minimal amount of original music, with Hathaway relying primarily on source music and ambient sound in each scene. Yet, as good as the craftsmanship is here, the film suffers from long stretches of pedantic exposition about how a lie detector, as well as other mechanical instruments, works, and clumsily incorporated pieces of voice-over narration, although admittedly some of this technology was fairly unknown back in 1948. Regardless, the inclusion of these scenes of exposition slow the pacing of the film, creating a lull in the second act. However, the flaws of the script are triumphed by the remarkable acting and overall intriguing story. Call Northside 777 still relates to the world today just as it did back in 1948, because the story of a journalist using his position to protect the citizens of his country is the centerpiece to one of our nation's most fundamental rights: the right to free press. Image Transfer Review: Hathaway and his crew incorporated documentary footage with their own material, which results in a variance between the picture quality at times. There are print defects and scratches throughout, though they never are distracting and are probably unavoidable considering the source footage. Contrast is usually strong and blacks look gorgeous. Unless my eyes are playing tricks on me, though, there is some slight edge enhancement around McNeal's face when he visits with Wanda Skutnik—though it is meager and barely noticeable if it in fact exists. Depth and detail are strong, creating a good transfer. Audio Transfer Review: The audio is presented in both its original English mono mix and a Dolby Stereo 2.0 mix. To be honest, I didn't notice a single difference between the two. Each has a claustrophobic range and plenty of crackling and hissing. When McNeal and Kelly meet with the paper's publisher, audio drops out completely in when dialogue is not being spoken. There's probably very little that could be done to solve that problem, but the hissing gets annoying after a while. A mono French track is also available. Extras Review: Film historians and authors James Ursini and Alain Silver kick off the extras with an audio commentary. Ursini dominates the track, though Silver gives good information about the actual events that inspired the film. For the most part this is really just a classroom lecture, which at times is slightly dull and at others contains some keen insights. Neither man seems enthusiastic to be recording his thoughts, but one highlight is when Ursini takes a shot at Spielberg's tendency to over sentimentalize endings. Following the commentary is the exceptionally brief Fox Movietone News reel, Motion Picture Stars Attend Premiere of Call Northside 777 (00m:56s). It's a collection of 1940 superstars having their picture taken, culminating in James Stewart making his mark in front of Grauman's Chinese Theater. Following that is the theatrical trailer for the film, as well as the trailers for House of Bamboo, Laura, Panic in the Streets, and The Street With No Name. The House of Bamboo trailer is presented in anamorphic 2.35:1 widescreen. All of the extras here feel pretty forced, though they are significantly better than nothing. 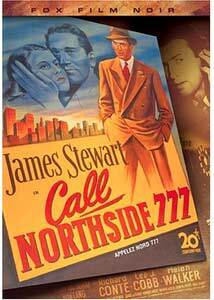 Call Northside 777 is a solid entry in the realm of film noir, featuring an excellent performance from James Stewart and first-rate support from the rest of the cast. The image transfer contains numerous scratches and print defects, but is ultimately aesthetically sufficient. The Dolby Stereo 2.0 mix doesn't sound all that different from the mono mix, so there's nothing stunning in that regard. The extras are welcomed, but nothing special.